Posted November 25, 2014 & filed under SIRENS History. Soldiers who fought in the First World War, then called “The Great War,” and survived came home with devastating injuries to both body and mind. 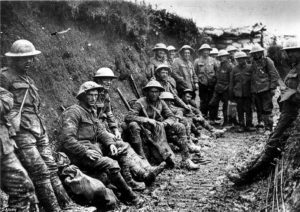 Over four million Americans served in the First World War, and served under ghastly conditions, facing for the first time in battle heavy artillery, machine guns, and poisonous gases. And while these physical traumas were terrible, the internal traumas may have been far worse. PTSD – post-traumatic stress disorder – isn’t a new thing. Called “shell-shock” at the time of the Great War, the damage inflicted psychologically on soldiers servi ng in the war was unanticipated. Men in the 1900s were expected to be “masculine” and repress their emotions. Crying and breaking down were behaviors thought unacceptable, and were often cited as reasons for placement in insane asylums. Doctors, and the public, had no way to understand the experiences of these soldiers, and they were treated indifferently at best and punished for their behavior at worst. The end of the war for these returning soldiers could not mean a return to “business as usual”, even if th at had been the hope. Technological advancements, urbanization, and immigration led directly to the social upheavals of the 1920s. 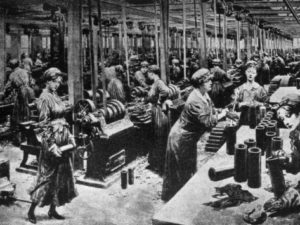 With so many men serving, killed in action, or returning disabled in body and mind, women had been needed in the work force, and they were reluctant to return to domestic situations, which served to strengthen the cause of women’s suffrage and independence. This independence was evidenced by the adoption of less restrictive clothing and shorter skirts and the fad for shorter hair that was easier to manage. Movements like pacifism, isolationism, and spiritualism grew following the end of the war as people sought to retreat from the horror. And the need for relief from the emotional traumas of the war may have contributed to the “anything goes” atmosphere that prevailed in the 1920s. Advertising, commercial manufacturing, the rise of the cinema, and the automobile promoted “new” and “more liberal” ideas that conflicted with the traditional thinking American soldiers left behind when then went off to fight. 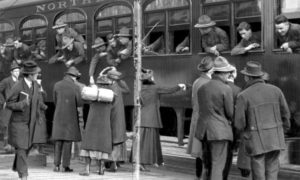 Any war impacts the generation th at lives it and the decade that follows it, but the changes in society following World War 1 were rapid and extreme. It would have been a tough homecoming for those soldiers. In my next post, what happened when women got the vote. Posted October 8, 2014 & filed under Writing Craft Tips. Your synopsis forms the basis for your query letter. Almost all queries today are email cover letters; your manuscript or pages are sent as a Word attachment – but these are requirements you should establish first as some houses still prefer your pages in the body of the email and rarely do houses or agents ask for hard copy. Note also whether the editor/agent prefers pages (usually the first 10-20) or the full manuscript. Never send something from the middle of your novel. All editors and agents will specify their requirements for submission, so follow those exactly. The norm today is multiple submissions are acceptable as long as you notify the recipient of your intent. My advice is to limit multiple submissions to 3-4 agents/editors in each round, and if you should hear back in the positive let the others still considering your submission know that you have interest right away. Also, the norm today is that if you don’t hear back in three months, consider your work rejected. Not nice, not fair, but that’s what it is. Should be no longer than a single typed page. Seriously. Shorter is better. Should be addressed to the individual editor/agent. Check spelling, check your facts. Find out what the editor/agent has previously edited/agented because you will tell them why you believe your work is a good fit for them. Your middle should be your synopsis or a reasonable facsimile thereof. This is where you really pitch your story, with an enticing, engaging summary based on your synopsis. Don’t go into details; leave the editor/agent hanging and wanting more – you are pitching your concept and selling your book. Your ending summarizes your previous publications if any, and your professional writing related experience (i.e., membership in SCBWI or other professional organization, MA/MFA from wherever, whether you are/have been a teacher or librarian). Non-writing related experience need not be mentioned. Don’t tell the editor/agent that your mother/aunt/children/students loved the story. Don’t go on and on with gushy personal feelings. Do sound professional, serious, and educated. After sending this out for a couple of rounds, if you’ve had no interest, revise and try again. Good luck! Posted September 28, 2014 & filed under Interviews & Guest Posts. Hi Darlene! 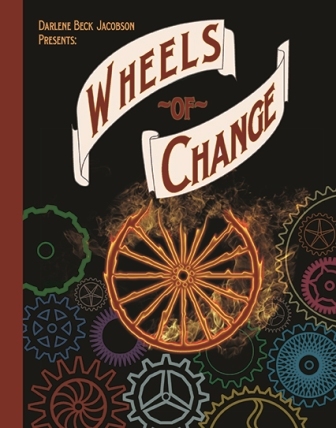 Please give readers a synopsis of WHEELS OF CHANGE. Racial intolerance, social change, sweeping progress. It is a turbulent time growing up in 1908. For twelve year old Emily Soper, life in Papa’s carriage barn is magic. Emily is more at home hearing the symphony of the blacksmith’s hammer, than trying to conform to the proper expectations of females. Many prominent people own Papa’s carriages. He receives an order to make one for President Theodore Roosevelt. Papa’s livelihood becomes threatened by racist neighbors, and horsepower of a different sort. Emily is determined to save Papa’s business even if she has to go all the way to the President. I love stories like yours that are set on the cusp of change. What inspired you to choose this particular time period and the shift from the era of carriage to car? There were two family facts I discovered while researching my family tree. One was that my paternal grandmother’s father was a carriage maker in Washington DC at the turn of the Twentieth Century. The other was that grandma received an invitation to a reception held at the White House by Theodore Roosevelt. She attended that reception and met TR. The story grew from there. While I was doing research I discovered just how much change was taking place during this time period in history. The more I looked, the more I realized how frightening it must have been to many people. I wanted to show how change affects us all and can bring welcome and unwelcome things into our lives. It’s up to each of us to decide the importance of those changes. We can’t stop change–it still happens all around us. But, if we make it work for us, we can see a better outcome. Emily is a strong character. Do you generally begin with character or with plot? I usually gravitate toward characters first, trying to find something special or unique that makes that particular character stand out. I also enjoy where the characters take me in a story; it is often to a place I hadn’t envisioned. Plot is always more difficult for me. I generally need several rewrites to flesh out plot elements. With WOC several plot elements were expanded or added after the manuscript was accepted. You have several important subplots (in particular, Henry’s). Please tell us about them and how they came to be. Henry was always part of the story. I wanted a character that was unexpected for the time and place, yet real and meaningful to Emily and her family. I doubt that a person of color like Henry would have been employed by my great-grandfather; but it seemed important to make that happen. The rights and gender roles of girls and women became more fleshed out in rewrites than in my original version. The subplot with William and the mouse was also added later, as was the thread buying scene, and Emily building a miniature carriage for Papa. It amazes me how an editor – especially one who also writes, like Marissa Moss my editor at Creston Books – can make a suggestion that takes my mind in a whole new direction. I love that part of the revision process. Do you have anything new in the works? I have two projects actually. The first is a PB titled TOGETHER ON OUR KNEES about a little known abolitionist and suffragist, Matilda Joslyn Gage. The other is an MG historical set in a Pennsylvania mining town during Prohibition. Posted September 26, 2014 & filed under Writing Craft Tips. If you read my “Synopsis” post, you’ll see that you’ve already got a start on crafting a logline. But we’re going to take it a step further. A logline is a one-sentence summary of your story. Think about a movie poster, with its brief but compelling summary, or the cover grab of your favorite best-seller. Those are loglines. And why do you need one? In part because you may experience an elevator moment. Now, a caveat. If you go to a writer’s conference, whether SCBWI, local or national, or any other, you will encounter agents and editors. Since the basic premise of all world behavior is “be nice” it follows that you will not, no never, ever, confront an agent or editor with an unsolicited pitch. As in never. Do I need to repeat? This is when you need a logline. Not a full-on pitch (that’s a longer item, for another time), but a one-sentence-can-be-told-in-30-seconds-or-less summary of your story. You can use it in that elevator moment, and you can use it in your query. Honing a good logline will also help you focus on what’s most important about your story. In the 17th Century Caribbean Sea the roguish yet charming Captain Jack Sparrow joins forces with a young blacksmith to rescue a governor’s daughter and reclaim his ship. In a dystopian future where one segment of society rules all teen girl Katniss Everdeen takes her sister’s place in a televised game to fight to the death. Put these elements together in a sentence that speaks to the high stakes of your story and you’ll have your logline. Posted September 23, 2014 & filed under Writing Craft Tips. Each time I attend a writing conference I’m reminded that one of the trickiest things to do correctly is write a synopsis. And yet the synopsis forms the basis of a query, so the more powerful you can make your synopsis, the better your query. I’ll post on queries soon, but I’d like to give you a worksheet on synopses here. This worksheet will hopefully guide you through the steps you need in order to craft the strongest synopsis of your work. You’ll be able to download this as a pdf file. Happy writing! And to read about crafting loglines, see next post here. Posted September 19, 2014 & filed under Interviews & Guest Posts. Full disclosure: Lindsey is a dear friend. I’ve admired her work for as long as we’ve known one another – almost ten years! And we are agency mates, clients of Erin Murphy. I couldn’t be more pleased. Please give readers a synopsis of EVIDENCE OF THINGS NOT SEEN. I was sucked into the story right away, and I confess that one reason was that Tommy is such a strong presence even in absence. How did you come to feel about Tommy? I’m glad you felt Tommy’s presence strongly. Originally, he showed up in one of the stories when the novel was linked short stories that all occurred around this patch of dirt by the side of the road called the pull out. It was my critique partner Anne Bustard who said, “I think this particular story might be a bit bigger.” That’s when I went back in and did a floor to ceiling kind of renovation of the book and Tommy became a thread through all the stories. I love the multiple points of view, the interweaving story lines. Did you write this novel in a linear fashion? Do you mean did I write it from start to finish with a beginning, middle and end? Nope. When it was linked short stories, I wrote them one after another. Boom. Boom. Boom. But after I had the piece of Tommy going missing, I had a time frame so I had to weave each thread in relation to the moment he disappears. That’s all when I added in the first person sections of the kids who knew Tommy. Gradually, I found that what I was doing was writing around the negative space. If you have something or someone who goes missing, what remains is cast in sharp relief. Even if Tommy wasn’t part of another character’s life, his absence still affects that character. Like, when you lose your keys, you are kind off course looking for it and all the people you ask if they’ve seen them start looking and they go a little off course. Or worse, when your child wanders away from you at a store and you and everyone around you goes into a freak out until you find her. So if the center of a story goes missing, everything wobbles. I wanted all the stories around Tommy to have that feeling that life is just a little bit off course. You know, Tommy would say that I did write the novel in a linear fashion because I wrote it in linear time whether or not I went back and shifted the structure of the book. That’s the kind of guy he is. I feel his presence every day. I probably always will. The notes are brilliant, allowing us to see not only more deeply into Tommy’s way of thinking, but they connect the story of his disappearance with the physics of dimensional possibility. Was that something you came up with early on? Almost as soon as Tommy showed up in my imagination, I knew he was a bright geeky kid who was a little bit off socially. Once his absence was a central thread, I started keeping Tommy’s journal. I wanted to know the way he thought. I wanted to know who he was. What I discovered was this brilliant kid who was in the middle of having his mind blown by particle physics. I knew his journal was important but all that I included in the manuscript that sold to FSGBYR was that little snippet at the beginning, which is still there. My editor Joy Peskin loved it so I included a bit more when I did a revision for her. I believe I recall that this novel was inspired by true events. Is that correct? If not, where did it come from? In the category of truth is stranger than fiction, I was double checking facts and I called the Blanco Chamber of Commerce because I set EVIDENCE in that neck of the Texas Hill Country in a town about the size of Blanco and I needed to check a few facts. I told the woman who answered the phone what my book was about and there was this long pause. “We had a boy that sounds just like your character who went missing a few years ago.” Then my side of the phone went silent. Turns out the boy came back but he had whole town in an uproar for a couple weeks. Wild, eh? As for the stories in the rest of the book, they aren’t real but they are inspired by real events. For instance, when I interviewed Karla Faye Tucker on death row many years ago, I couldn’t stop thinking about how her story had led her to kill someone. Like where did the stitch in the fabric of her life break so that the whole tapestry unravels one very bad night? She haunted me until she showed up in this book. Truth and factual events captivate me. Then I like to go back and look at the why and how of it. I’m a sucker for epiphanies. I love the aha of life. That’s an amazing story. We were at Vermont College of Fine Arts together, a memory and friendship I cherish. Was any of this novel a part of your Vermont College experience? When I graduated from VCFA, two stories–Comic Book and Lost–are in my creative thesis. But what was really important about the VCFA experience and this novel was faith. Faith in my writing. Faith in following and developing an idea. Faith that my ideas were worthy. I don’t know if I could have found that faith without going to VCFA. Every month for two years, I leaped off a cliff and sent my advisors pages and pages of writing. Each month, I made those pages better with tools in my writer’s toolbox. The VCFA experience was pivotal in my development as a writer and certainly this book. You know the title of this novel comes from a quote in the bible about faith: “Faith is the substance of things hoped for, the evidence of things not seen.” In way, this book is a result of that faith in myself as a writer. What’s your typical writing process? Plotter, or pantser? Hmmm, I bet I’m going to write every book just a little bit different every time. Even though, I probably pantsed my way into this novel, I held each thread in my head before I wrote them down. I knew where I was going with each section. I knew who the characters were. On the next book, I purposefully journaled for quite a while. I figured out the characters, the backstory, the crisis and the climax. What was most important was finding the inciting incident. It is the moment that makes the story unravel to an inevitable conclusion. I think of backstory as the hand of god. The reader will believe one coincidence at the beginning of the book. I try to make sure that one coincidence will make all the dice in the hand of god fall on the table. Gradually. Inexorably. Fatalistically. Lovingly. (I have to absolutely love my characters.) After I finish drafting and let it rest, that’s probably when I will do that hard work of making sure it hangs together on the arc of a plot. I do like to write intuitively when I’m drafting but I’m holding the story in my head so I have a map of where I’m going. If writing a novel is like a road trip, then I’m all about the surprises along the way in the first draft. I still get to the destination because I have the map but I’m stopping at cafes and pull outs and overlooks all along the way. The working title is Inside the Notes. Here is the inciting incident: A young girl arrives in Boston. First time away from home. She is staying with a couple near the music conservatory where she is studying for four weeks. As she is unpacking, the clock radio in her room clicks on (the coincidence) and she hears men’s voices reading poetry and letters. It is a prison radio show. The girl knows her father is in prison for killing her mother when she was two years old. It is the first time she has considered he might be real and have a voice. The journey begins. Posted September 19, 2014 & filed under Book News. Posted September 12, 2014 & filed under Book News. Kendra Levin of Viking has acquired my first middle grade, CHATELAINE: THE THIRTEENTH CHARM in a pre-empt. It’s slated for a winter 2016 release. Posted June 23, 2014 & filed under Book News. I’m pleased to announce that my second novel and the companion to FAITHFUL, FORGIVEN, is now available as an e-book on Amazon Kindle for $2.99. Kula Baker never expected to find herself on the streets of San Francisco in 1906. The daughter of an outlaw, Kula is soon swept up in a world of art and intrigue – a world she hardly dared dream of back in Montana. She meets handsome David Wong, whose smiling eyes and soft-spoken manner have an uncanny way of breaking through Kula’s carefully crafted reserve. Yet when a mighty earthquake strikes and the wreckage threatens all she holds dear, Kula realizes that only by unlocking her heart can she begin to carve a new future for herself. 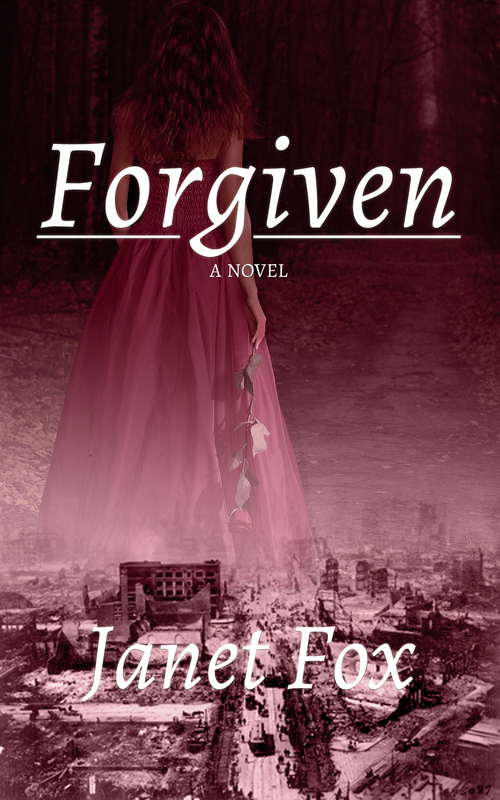 This is the second launch for FORGIVEN. Unfortunately, it’s been out of print for almost a year, but fortunately my options as an author with an out-of-print book are now greater than ever. I’ll share a bit of my journey in case you’re curious or in the same position. I couldn’t be happier with the design, which pulls together an image of San Francisco after the earthquake and fires of 1906 with the period flavor of the girl’s clothing and the sense of searching that dominates the novel. I found Elijah after scouring the web for cover designers and choosing him for the clarity of his designs. I also had advice on all matters including cover design from Chris Eboch and Dotti Enderle, who have much experience with e-book creation. And I should add that Elijah’s price was extremely reasonable. After returning my electronic rights to me, my publisher graciously supplied me with an epub version of the manuscript. This was great, because it allowed me to retain much of the interior design; but Amazon uses mobi files, not epub, and I’d decided to launch with KDP Select because the terms are better for me. My web designer Lynn Kinnaman helped me by converting the epub first to Word and then to mobi, and then we set up the book to publish. We had to go through several corrections but Amazon makes that easy by allowing you to preview the text since sometimes glitchy little software errors do creep in. I looked through the text carefully because I find it no fun to read an ebook with quirky issues. If you have a final, clean manuscript in Microsoft Word, it’s much easier to go from there, but all interior design has to be removed. Frankly, I was thrilled to have Lynn’s help, as my left-braininess doesn’t extend to the tedious job of formatting. It felt like it took forever, but really the process was very easy, thanks to all the advice and help. If you have questions, please fire away! Posted April 15, 2014 & filed under Short Stories & Articles. I’m pleased that my contemporary young adult short story Jewels, set in New York City, is included in this anthology of work by Bozeman-area authors. The anthology, published by Bangtail Press, is available exclusively at Country Bookshelf in Bozeman, Montana. Wren pulls on a knee-high and slips her right foot into the shoe. The leather glows; her foot is dainty. A princess foot. She slips on the left. She steps away from Violet, away from the saleswoman, walks across the floor to the mirror, where only her feet appear, her torso sliced off at mid-thigh. Her feet, in those emerald skins, could walk right out of the store and no one would know it was her. They might think, that’s Violet’s BFF. That’s Violet. “I’ll take them,” she hears Violet say. Wren turns. Smiling, Violet leans toward the saleswoman and hands over a credit card. Wren purses her lips. Wren lifts one shoulder and says, “Okay.” She takes the wallet from Violet and fishes out her card, placing it flat in the saleswoman’s palm. Wren feels hot, then cold, as her card slides through the reader. Violet moves off, examining one pair of shoes after another. The saleswoman flips the tissue over the shoes, snaps the top down.